Government-to-business represents the relationship between the public and the private sector. This covers the relationships between the government and corporate bodies and organizations of the private sector. The private sector has more potential to reduce costs because of the high competition and improved procurement practices. Hence G2B initiatives receives greater amount of importance and attention. These partnerships facilitate collaboration between levels of government and empower state and local governments to deliver services more effectively. 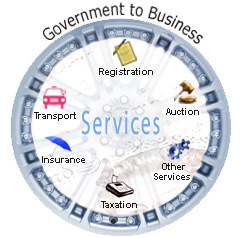 The services are undertaken to make interaction between the business and government more efficient and effective. The aim is to reduce burden on businesses, provide one-stop access to information and enable electronic communication. Online government to business allows entrepreneurs to access information about legislations and regulations. This sector also gives access to relevant forms needed to comply with governmental requirements for their business. The main objective of G2B is a national economy with flexibility and competitiveness within the global markets. Some examples of G2B services include corporate tax filing or government procurement process through the Internet.